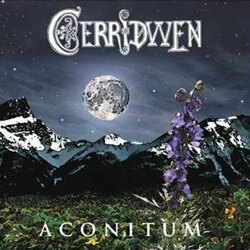 Cerridwen is a symphonic ethereal folk metal band from Bellingham, USA that will release its debut EP “Aconitum” via Cascadian Alliance on September 16th, 2014. The physical edition of “Aconitum” that was initially released digitally on October 2013, will be out with all-new album art, and a slightly refined mix/master. The project began in 2005 known as Aconitum, fashioned by John and Jenn, keyboards and drums, respectively. Over the next five years, three other members joined, Genevieve on vocals, Cavan on guitars and Josh on bass. After their line-up was finalized, they decided to change their name to Cerridwen. According to legend, Cerridwen was an enchantress who had the ability to grant poetic inspiration. She also was sometimes known as the Goddess of Rebirth and Transformation. With tellings of olde mythical folklore, spanning from the Celts to the Norse to the Baltic, the band has interwoven old religion with modern music. Two of the band’s members (Cavan and Jenn) are also on the folk metal band Moss of Moonlight.